An Internet meeting of people who use autopathy. We know from the conferences and other sources that autopathy, a holistic method of bringing the body and the mind in harmony, helps also people who had been caught off guard by the signs of ageing. In some cases, it happens to people aged thirty, in other cases much later. What are the specifics of healing the signs of ageing? What experiences are there? Which method of autopathy to use for which situation? How to keep oneself in a good psychic and physical condition? These subjects will be addressed by Jiri Cehovsky (aged 70), in the first part of the webinar. Included will be also a new revelation about autopathic preparation made from the information of the 6th (third eye) chakra which already surprised many by its influence. 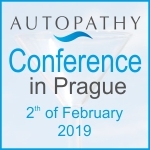 In the second part Jiri will be answering questions and comments concerning autopathy and the experiences of the webinar’s participants.